I started using Notion.so a few months ago, then decided to pay for a year subscription when they dropped the price to $4/mo. Since that time, I’ve really taken to adding notes, structuring things, working on projects, etc. 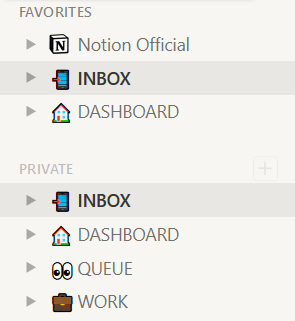 It’s a work in progress (like everything in life), but Notion is such a great tool for so many things. That said, I wanted to share a copy, or demo version, of my Dashboard page and subsequent pages underneath. Partly to demonstrate the power and flexibility of Notion and partly to inspire people who already use the tool but don’t know what else they can do with it. You can see I’ve added the Dashboard and Inbox to my favorites so they’re easy to get to at all times. I’ll demo the Inbox, Queue, and (maybe) the Work sections sometime in the future. OK, enough of the jibber-jabber … now to the reason you’ve read this far, the link to the demo version of my dashboard. Click the image below and have fun exploring! Note: see how cool Notion is for creating? I love that I can create all of that with their app or the browser (very similar to putting together a document, but with drag-and-drop capability) and then be able to share to the whole world if I want. I can also share with specific people and even give them editing rights. Just wanted to say keep up the good work man! Been looking at your blog all day today and its really inspiring stuff! I appreciate the kind words! Things have been crazy busy at work … but my next blog series will be about my Todoist layout and system (including how I use my notebook). Look forward to seeing it, I keep my system fairly straight forward, I used Evernote before I took on Notion. My system now includes Todoist and Notion so I’ll defiantly be checking that out.